Every food blogger on the internet planet has two recipes under their belt – in their blogging recipe list: a banana bread and a chocolate chip cookie. Most likely they have many versions of both. There are equally so many people with so many different taste. Chocolate chip cookies are a much different and broader ball game to play than bread. Soft and fluffy, thin and crispy, crispy edges with soft centers, butter based or oil based, brown or white sugar…the deviations are numerous. There is one fact we should all give 100% more credit towards: vegan cookie dough is more virtuous and edible than a basic Tollhouse or any egg inclusive recipe. You have NO worries about salmonella. There are no raw eggs in vegan baking. I have never eaten or understood the appeal of raw dough. It’s actually a sign of a nutritional deficit, but not what this post is about. Virtuous by being vegan? We will return here though. But bread, BREAD baking is chemistry. This is no lie. Whether or not yeast is involved DOES NOT matter. Yes, cookies are baking and all baking is chemistry. But bread is a mood, a behavior, an emotion, similar to the movie premise Like Water For Chocolate. Watch it if you haven’t! 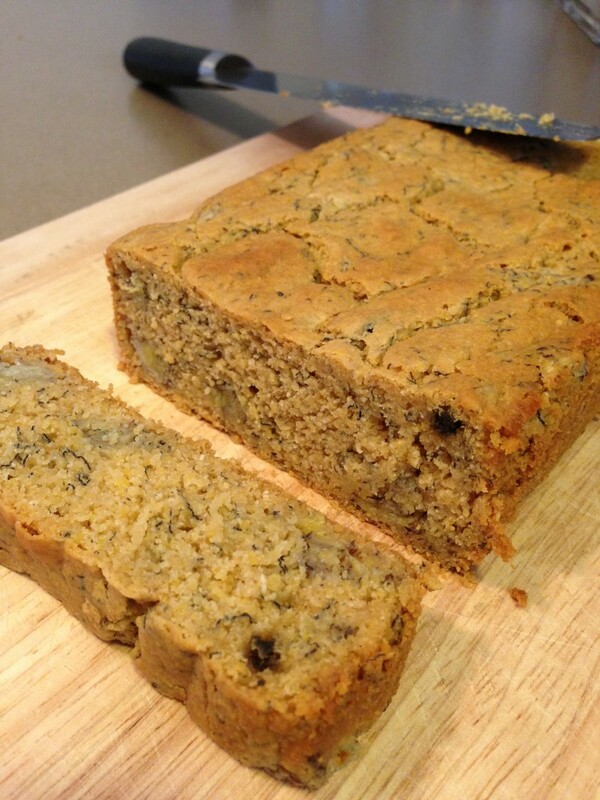 A blogger I admire titled an old post Virtuous Banana Bread. It was a wholesome recipe she had adapted. I just got a bit stuck on the word virtuous. It has a weight. It means ‘morally excellent’. Thus, why was this recipe so superior? Coincidentally, why do people with the strictest diets feel their way of eating is morally superior? This lovely blogger is in no way implying such with her post. She only recently started baking alternatively and she doesn’t have hang-ups; just trying to find what works for her specific needs. Coincidentally, I was mailed a free copy of the book Kale and Coffee, A Renegade’s Guide to Health, Happiness, and Longevity Quite a fast and entertaining read. And you know what, a prime example of the type of person who extols the virtues of their behavior. This author had enough sense to recognize that as much as he wanted to be vegan or do detox fasting or be a fruitarian…it was no good for his health! I did write up a better review on the Amazon page. Just like an anorexic looses the ability to see how skeletal their frame has become, so many people get hung-up on the ideal of a diet: its label, the category it puts you in, its classification that somehow up-classes you. Is it healthy for you really? I know A LOT of overweight vegans and vegetarians. I see the dark under-eye circles of people that eat a lot of sugar or have liver toxicity. I can smell the sourness of your dairy consumption, and see the bloated belly of too much animal meat and not enough fiber. Beer bellies exist because of too much yeast. If you know what you’re looking at, everyone gives themselves away. No, there is not one way that is THE way. There is imbalance = dis-ease, disease in the body. And why would I like to label my banana bread as virtuous or superior? Because most anyone can eat it. It has no limits. Gluten free, vegan, super low fat, low-glycemic sweetened. If you have a corn allergy, I offer a substitution. It is short (no eggs to help it rise) but it is mighty. Fresh banana chunks you can see and super ripened pre-frozen banana. Intense Nut free. In a smaller glass bowl, microwave the frozen banana 30 seconds to soften. 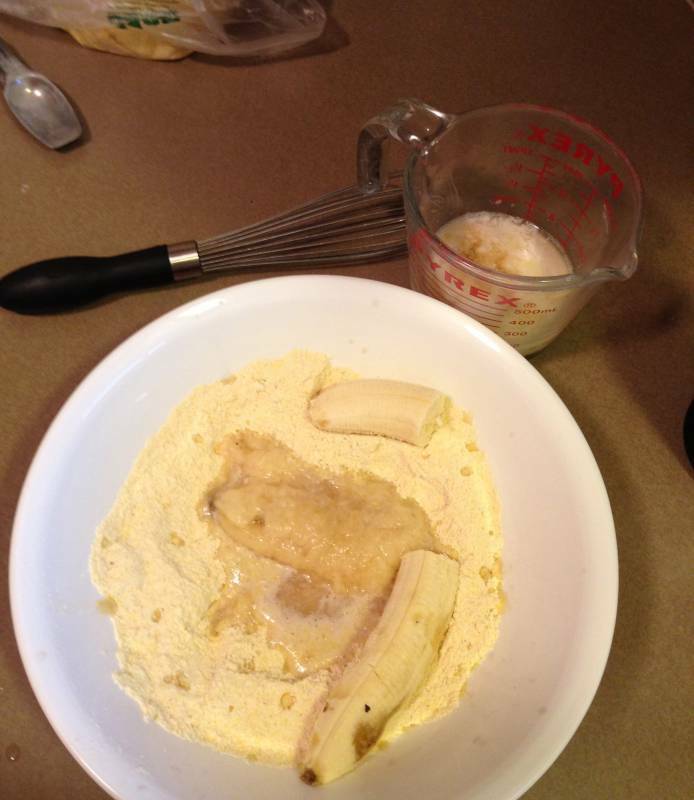 Add the super ripe counter-top banana and fork mash it together. Whisk the dry ingredients and make a well in the center. Pour the wet into the center. Mix with a fork. Pull the dry towards the center and simultaneously turn the bowl so all the dry edges incorporate into the liquid mixture, in a folding over motion. Make sure it’s all incorporated. You don’t have to super beat it to death like processed box cake; and gluten free baking means you aren’t toughening the wheat proteins which would make it gummy by over-mixing. Taste the batter. If it is kinda sweet, it’ll taste less sweet baked. Add 1 T dry sweetener of your choice or a pinch or half dropper of stevia glycerite. My bananas were really sweet. Mix in nuts now if you like. 1/4 to 1/2 cup raw bits or pre-toasted walnuts or pecans. Use a rubber spatula to transfer to the pan and bake in the center of the oven at least 30 minutes. It will get a deep golden brown and the edges will pull away from the sides like it’s tightened up. Do not cook it over 40 minutes. The recipe is forgiving though. I let it sit in the pan 10-15 minutes before flipping it out onto a cutting board or metal cooling rack. It can sit on the counter wrapped in plastic or tupperware a good 5 days. It will get more moist verses dry. After it’s cooled, you can wrap it in foil or wax paper then put it in a freezer bag in the freezer for a good 2 months. *If you need to substitute the corn flour and still want gluten free, cut the 1/2 cup and use 1/2 MINUS 1 Tablespoon more rice flour WITH 1 Tablespoon of either arrowroot or tapioca starch. Sometimes we don’t need or want directions, and we just want to eat deliciousness and enjoy it. That is more than necessary, and living life. Virtue is in listening to what your health needs over what your mind thinks it wants though.